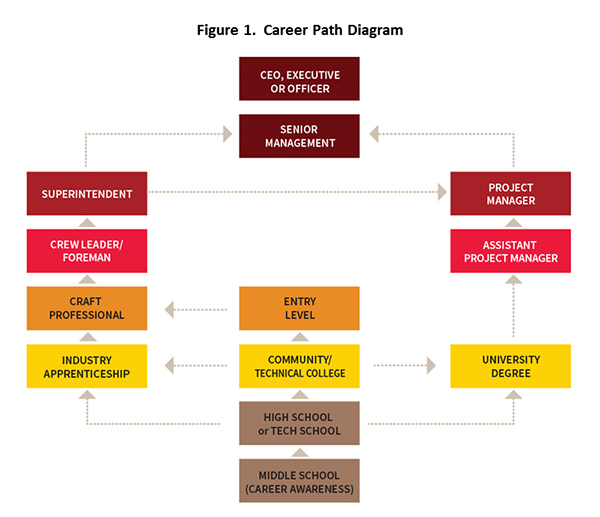 An NAHB study published earlier this year discussed how hands-on experience in the construction trades can be a step on the path toward some of the higher paying positions in construction businesses, including executive positions (fig 1). This study uses new data collected from single-family home builders in 2017 to establish that such career paths do, indeed, exist. In particular, the new data identify eight senior positions at home building companies that are often to nearly always filled by some with experience in one or more of the construction trades. Average annual compensation (salary and bonus combined) for each of the eight positions is at least $80,000 to $100,000, if the position is Head/Director or above of one of the company’s major functions. President/CEO: 95 percent of single-family builders have this position. 89 percent of these say the position is always filled by someone with experience in the trades. Average annual compensation (salary and bonus combined) is $157,401. VP of Construction: 36 percent of the builders have this position. 96 percent of these say the position is always filled by someone with experience in the trades. Average annual compensation is $131,918. Head/Director of Land Acquisition: 8 percent of the builders have this position (but 34 percent of builders with $15 million-plus in business). 87 percent of these say the position is always filled by someone with experience in the trades. Average annual compensation is $173,466. In addition to purely monetary compensation, the positions frequently come with fringe benefits such as paid vacation and sick leave, health insurance and 401(k) plans. The rest of this article provides background, describes the data sources, and discusses the survey results in more detail. The earlier study cited above presented results from an NAHB poll of roughly 2,000 young adults, ages 18 to 25, conducted online by Morning Consult. Among other things, results from that poll showed that young adults often said they would reconsider a decision to work in the construction trades for an annual salary of $75,000 or more. Using information from the Occupational Employment Statistics produced by the U.S. Bureau of Labor Statistics (BLS), that study also showed that, although average annual wages tend to be less than this for construction workers in most of the trades employed by home builders, there are a number of trades where the top one-fourth of workers do earn at least $75,000, especially in certain parts of the country. However, this doesn’t tell the full story, because workers who start out in the construction trades may advance to executive or other high paying positions (as illustrated in fig. 1). Data recently collected by NAHB provides information about executive and other higher paying positions at single-family home building companies, including information on how often these senior positions are filled by someone with experience in one or more of the construction trades. The data come from the Single-family Compensation Survey conducted by NAHB’s Economics & Housing Policy Group in July of 2017. The survey collected information from 308 single-family builders about full-time and part-time positions they have at their companies. Figure 2 shows the incidence of eight of the top positions at single-family home building companies. According to the survey, the most common of the eight is President/CEO, with 95 percent of the builders reporting that 0they have this position full-time at their companies. 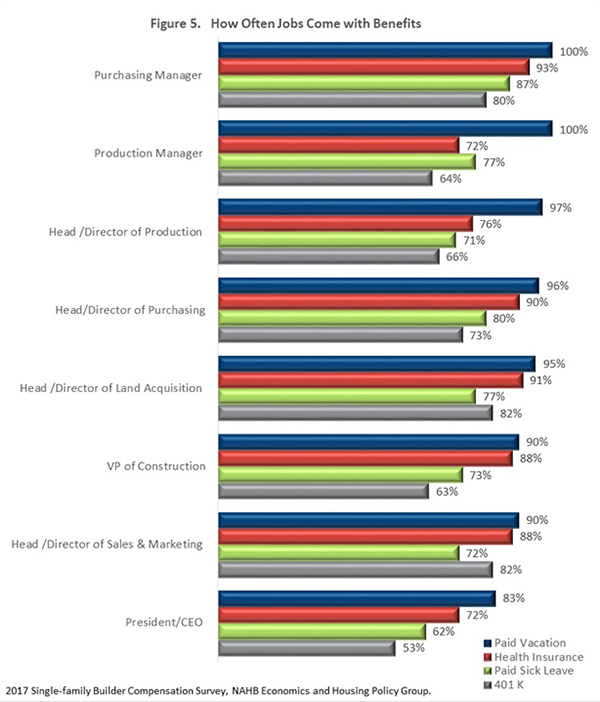 Of the other positions in the figure, VP of Construction is the next most common (full-time position existing at 36 percent of the companies) followed by Head/Director of Sales & Marketing (19 percent). If some of these percentages seem low, it’s important to remember that single-family builders tend to be relatively small businesses that often use subcontracting for the bulk of their construction work, so many of them do not have large numbers of full-time employees. According to NAHB’s 2016 Member Census, the median number of employees among single-family builders is 4. Many of the positions covered by the compensation survey therefore exist primarily at the larger single-family construction companies. President/CEO: Owner, leader, senior manager of the company. VP of Construction: Lead decision maker about company’s construction practices and policies. Head /Director of Sales & Marketing: in charge of marketing strategy to promote the company and product. Head /Director of Purchasing: in charge of ordering and negotiating building materials. Production Manager: responsible for field operations, including budgeting and cost controls at the divisional level or for smaller company. Head /Director of Production: manages engineers, production managers and implements company’s production policies. Head /Director of Land Acquisition: in charge of land acquisition, development, and zoning issues. Purchasing Manager: orders and negotiates for building products at the divisional level or for smaller company. Although NAHB conducts a single-family builder compensation survey regularly on a three-year cycle, 2017 was the first time the survey included questions on how often certain positions were filled by someone with hands-on experience in one or more of the construction trades. As fig. 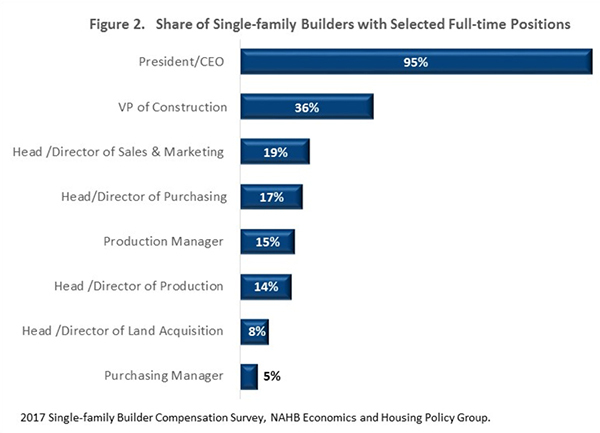 2 has shown, nearly all single-family home building companies have someone serving full-time in the President/CEO position. 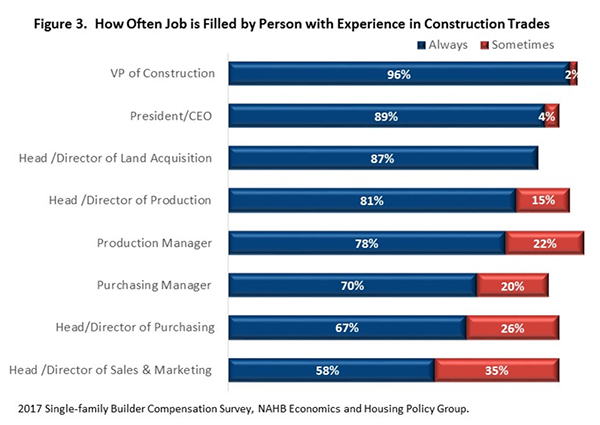 In NAHB’s survey, 89 percent of the builders with the President/CEO position say the position is always filled by someone with experience in the construction trades, while 4 percent said the position is sometimes filled by someone with experience in the trades. Even at the bottom of fig. 3 where “only” 58 percent of builders with the position say Head/Director of Sales & Marketing is always filled by someone with experience in the construction trades, another 35 percent say the position is sometimes filled by someone with that experience. In short, all eight of the positions considered here, to the extent that they exist at single-family home building companies, are filled very often by someone with experience in the construction trades. Moreover, this is almost always true for the company’s top decision makers, such as the President/CEO and VP of Construction. As with any other type of business, most readers would probably expect the top decision makers at home building companies to attain the highest levels of compensation within that company. NAHB’s 2017 Compensation Survey provides information for the eight positions mentioned above that are often filled by someone with experience in the trades. For this purpose only full-time positions are considered. Because a substantial share of the compensation for senior positions often comes in the form of bonuses, averages for both salaries and bonuses are computed and shown. Bonuses are averaged across all companies that have a particular full-time position. If the company doesn’t pay a bonus for the position, the bonus is counted as $0 and included in the average. This way, average salary and bonus can be added together to produce an average total compensation figure. For President/CEO of the single-family home builders in the survey, the average salary is $113,222 and the average bonus (with $0 bonuses included) is $44,179, for an average annual compensation (of salary and bonus combined) of $157,401. 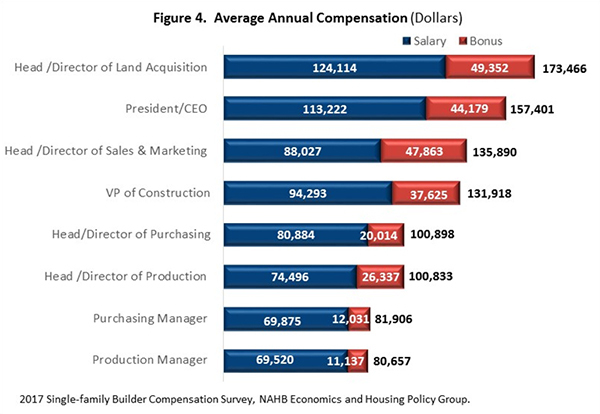 Compensation is even higher than this for the Head/Director of Land Acquisition: average salary is $124,114, and the average bonus is $49,352, for an average annual compensation of salary and bonus combined of $173,466 (fig. 4). At first glance, it may seem peculiar that Directors of Land Acquisition earn more on average than the company’s President or CEO, but it is important to remember that nearly all of the companies have a President or CEO while a Head/Director of Land Acquisition is relatively uncommon, and the companies that have one tend to be the larger ones. In the 2017 NAHB Compensation Survey, fewer than 3 percent of builders expecting to earn less than $15 million in 2017 reported having a full-time Head/Director of Land Acquisition (none at all of the builders expecting to earn less than $1 million). In contrast, slightly over one-third of the builders expecting to earn $15 million or more reported having a Head/Director of Land Acquisition. For purchasing and production managers, average compensation is roughly $80,000 per year. For the positions in fig. 4 that are more senior than this (Head/Director or above), average annual compensation is at least $100,000. In addition to the purely monetary compensation, NAHB’s Compensation Survey also asked about other or “fringe” benefits. Across the eight positions described above (and shown to be often filled by someone with experience in the trades), the most common fringe benefits are paid vacation leave, health insurance, paid sick leave, and tax-deferred pension plans allowed under 401(k) of the Internal Revenue Code. The incidence of paid vacation leave ranges from 83 percent of President/CEOs at the home building companies to 100 percent of Purchasing and Production Managers. The incidence of health insurance provided as a benefit ranges from 72 percent of President/CEOs to 93 percent of Purchasing Managers. The incidence of paid sick leave ranges from 62 percent of President/CEOs to 87 percent of Purchasing Managers. And the incidence of 401(k) plans ranges from 53 percent of President/CEOs to 82 percent of Head/Directors of Land Acquisition and Sales & Marketing (fig 5). It is probably not surprising that, of the eight positions shown in the figure, the incidence of a particular benefit is lowest for the President/CEO, given that this position is sometimes filled by the owner of the company. Home Builders Institute, NAHB’s workforce and training development arm, has long argued that learning one of the construction trades can be the first step on a path to the higher paying positions in construction businesses (fig. 1). NAHB’s latest Single-family Compensation Survey provides concrete evidence that such paths do, in fact, exist. For example, in companies with a VP in charge of construction, 96 percent report that the position is always filled by someone with experience in the trades. For nearly 90 percent of the builders, the company’s President or CEO has experience in the trades. In all, this article has covered eight senior positions at single-family home building companies that, if the companies have the position, are usually to almost always filled by someone with experience in the construction trades. Moreover, average pay for these positions is higher than the $75,000 per year many young adults say would motivate them to re-consider careers in the construction trades. If bonuses are included, all eight of the positions described above earn, on average, at least $80,000 per year. The average compensation ranges all the way up to $157,000 for the President/CEO of the company and $173,000 for the Head/Director of Land Acquisition, a position that exists at many of the larger ($15 million-plus) single-family home building companies. Moreover, these positions frequently come with various fringe benefits such as paid vacation and sick leave, health insurance and 401(k) plans. This article has presented a relatively small subset of the data collected in NAHB’s 2017 Single-family Compensation Survey. Of the 39 positions covered in the survey, for instance, the article described compensation and benefits for only eight. A full report with complete cross tabulations and charts for all 39 positions will be published by BuilderBooks in time for release at the 2018 NAHB International Builders' Show®. For more information about this item, please contact Paul Emrath at 800-368-5242 x8449 or via email at pemrath@nahb.org.